There are four main reasons to shear sheep. In Britain, most breeds of sheep have quite poor wool quality, which means it is not worth much. In most cases, the price you get for selling the wool is much less than it costs for someone like me to come and shear them, so in this country we don't shear sheep to make more profit. There are some flocks of sheep, mainly in New Zealand, which are breed just for the wool as it is of an exceptional quality, that is to say, the aim is NOT to produce lambs to sell for meat, but just shear them for the wool. If the right breed of sheep is used (such as Merino), the price you get for the wool is higher than the price you would get from selling a pair of lambs for meat, (which is what the aim is on most commercial farms in Britain.). 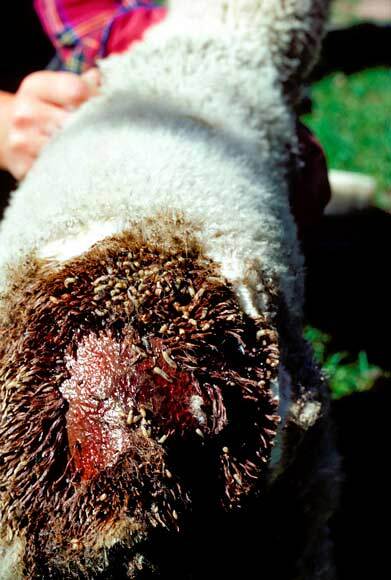 One thing that effects the quality of the wool is the male and female hormone, so on the wool farms they tend to use castrated males (Whethers), which of course do not have the relevant organs to produce hormones, and neither are they able to breed from them. As some breeds of sheep end up with a winter coat of wool that is two or three inches thick, then they do get rather warm on the hot summer days, as we would if we were to wear a jumper that thick when the temperature is 30 decrees Celsius. So, with less wool they are a lot cooler. A lot of sheep will lose some of their wool naturally and end up looking quite tatty, and of course, the wool ends up wrapped round hedges and barbed wire which makes the field look very untidy, so, if the sheep are sheared you can control where the wool ends up, such as, in a bag! If you don't have a strong stomach DON'T read any more of this page and certainly don't scroll down and look at the picture at the bottom.